Curious what Korea’s best beach is like during summer? The Korean students are out of school for the summer so this is the week that most families take vacation. Many businesses even close so that the owners and employees can enjoy some well deserved time off. Many of them head to Haeundae Beach in Busan. 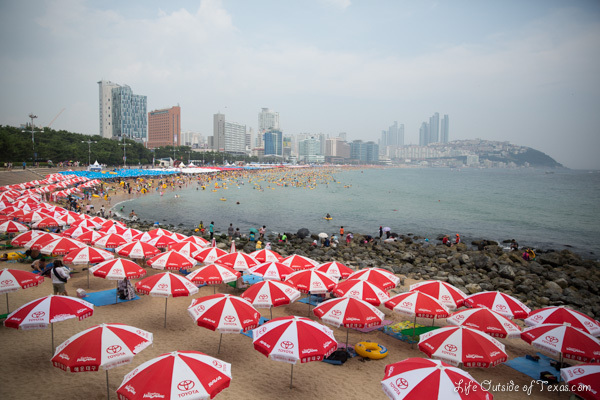 The beach is completely lined with umbrellas as far as you can see… because who wants to get sun at the beach, right? And the sea is full of yellow floats. This entry was posted in About Korea, Busan, Summer and tagged beach vacation, best beach in Korea, expat blog, Haeundae, Haeundae Beach, Haeundae Beach in summer, most popular beach in Korea, photography, travel, umbrellas on Haeundae, What to do in Busan by Meagan & Dave | HappilyEverExpat.com. Bookmark the permalink. For me, the rows and rows of umbrellas spoil the scenery. I prefer the disorganised chaos of Australian beaches where you set up your towel wherever and the clearer views without the umbrellas. I agree. In 2 1/2 years, this was my first time to visit Haeundae Beach during summer for that very reason… and I only went for the photographs. although it does appear that there are more umbrellas than people? The end of the beach that I was on wasn’t as popular… But for the most part, all of the umbrellas towards the middle areas of the beach were occupied by families. They definitely have a different way of doing things on this side of the world. I love that photo! Organised but slightly crazy looking. It looks strangely fascinating! Thank you so much! I made a special trip (about an hours drive) just to see what all the fuss was about.